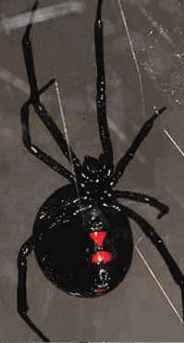 Here are some pictures of the Black Widow spider, both male and female species, so that you can better learn to identify this specimen. 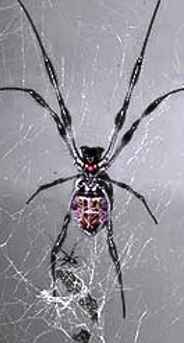 The female arachnid is much bigger (the male is about 1/3 its size), and it shows the well known and noticeable red hourglass on the bottom side of its abdomen as it is possible to see in the picture on the top left-hand corner. The male's venom is not poisonous for humans. Its body is much thinner and its legs are much longer. Seven days after mating, the female lays a number of 2000 eggs. These eggs have the appearance of jelly capsules of a transparent white, which are protected and separated in different sacks all over the web. In a month or so, the baby spiders grow and tear the sacks, getting away from their mother to start their own arachnid lives. They are so small that they can make use of air currents in order to travel away. 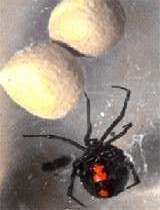 A black widow spider usually lives for three years.